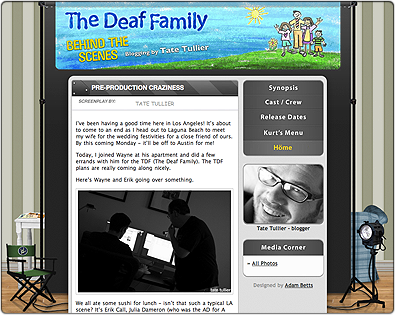 Updated blog design for Mösdeux‘s next comedy film “The Deaf Family”. Shooting will start this September 4th in Texas. Original Behind the Scene design can be seen here: Behind the Scene: “A Permanent Grave”. Hi Adam, I suprised you succeed your carrer! I am so glad this. I did saw your brother at Orando Deaf Expo last year.. I hope i can keep touch with you and your brother. Here my email [email protected] on my Sidekick Pager.. Hope hear from you very soon..